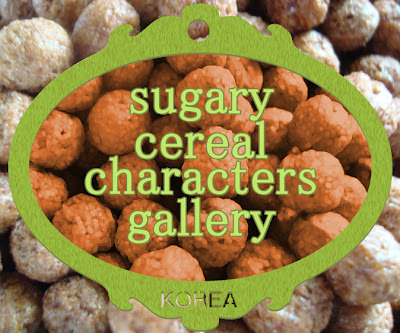 Welcome, dear patron, to the Sugary Cereal Characters Gallery in Seoul. Let me guide you through our fine collection of cereal boxes. 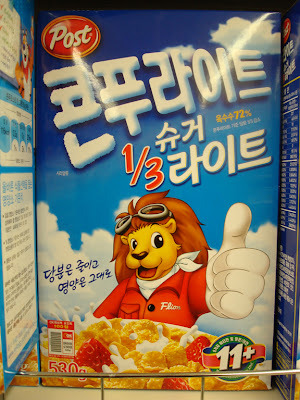 Breakfast cereal is not a major staple of Korean breakfasts. The breakfast cereals movement has its roots in the United States of America. As such, many of the pieces in our gallery borrow from the work of artists abroad. The brightly colored piece above is such an example. This piece is more conservative in its use of color than the previous. It utilizes mostly warm earthtones. This is likely to invoke a chocolately aesthetic. Notice how typography dominates this piece heavily. This is quite rare. Unlike other pieces, the words "Oreo O's" are emphasized boldly while the trade character almost goes unnoticed. Here we have allowed you to see a close up of the cartoon character. The character is likely meant to represent the white substance in Oreo cookies. It is a wonder that the artist chose to de-emphasize such a scrumptious substance. Here we see a reinterpretation of the original Corn Frost piece. The bland white background and subtle pose of the trade character align with the conservative restrictions of the Light Sugar aesthetic. Why don't we take a look at the original Corn Frost design? POW! Unrestricted by the confines of the Light Sugar aesthetic, this box design is really allowed to pop! Through a bright blue background and Tony the Tiger in the pose he was truly born for, the viewer can only be convinced that this original is superior. However, if you look closely at the bowls of cereal in both pieces, you'll notice that they are identical. We now move on past the American breakfast cereal boxes and into our local collection. These pieces build upon the work of American cereal box artists. We have created this East vs. West comparison for you. The similarities are striking. Are the Korean artists truly building upon what the American artists have created? Or is their work merely derivative? In either case, the American influence is evident. 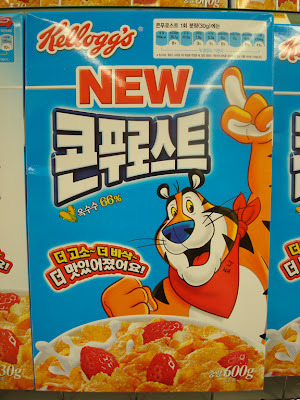 Look closely and you will notice that the American tiger has his name "Tony" written in Korean hangeul on his bandana. 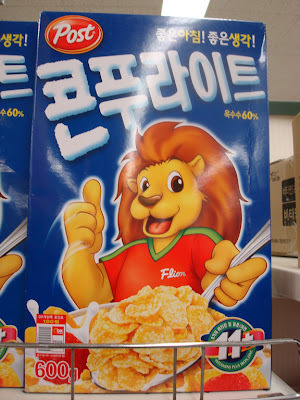 The Korean lion "Flion" has his name written in a cursive English variant of Latin on his soccer jersey. We take this as evidence that both artists must have respected each other's work and cultures. Notice how Korean artists resist the blandness of the Sugar Light aesthetic in the piece above. Rather than blandness, they utilize symbols of the upper atmosphere to represent lightness. 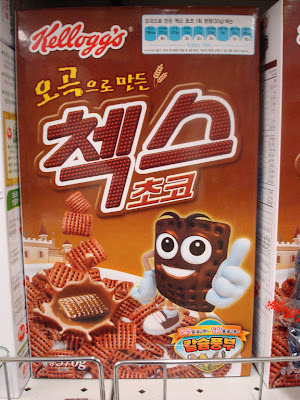 Here's a Korean example of a chocolatey aesthetic. Our Starberry piece is an exquisite example of a brightly colored cereal box. It reveals the society it was created in. This robot-like trade character reflects the fascination with robots in Korea. It shows the hopes for robots to make life faster, easier, and even more tasty. 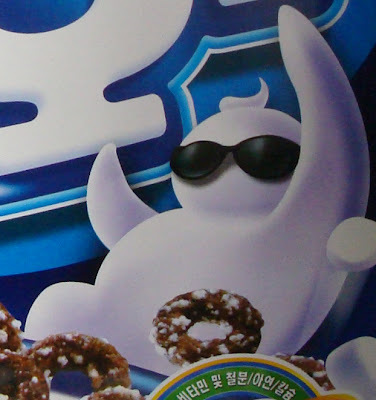 Alas, the world of cereal box art is not free of commerce in Korea. Here we see the beloved animated character, Dooly, being used to generate profit. In the piece above, he is donning wizarding garb and attempting to make Choco Ball appear healthier than it actually may be. However, does this Dooly commercial tie-in automatically prevent the piece from being considered art? I personally do not believe so. If you pay very close attention to the Choco Ball piece, you'll notice the little girl hanging off the side of the bowl. Her expression merits great attention. Notice the artist's choice to give her only three teeth. This choice, in combination with the rest of her expression, makes her look somewhat crazed. 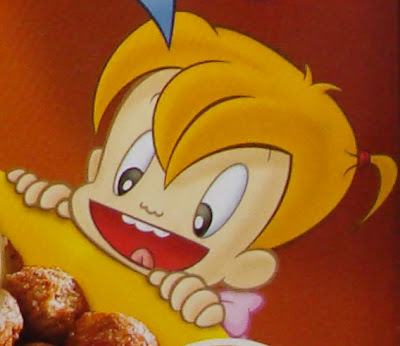 She looks as if she is mesmerized by Choco Ball and must eat the cereal now. I believe the "three tooth design" should become the standard symbol for representing a character's voracious and urgent appetite. Commercial or not, this "three tooth design" is truly a contribution to the breakfast cereal art world. 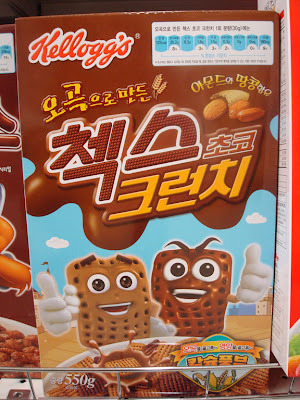 The late development of breakfast cereals in Korea allowed them to arise within a highly advanced technological infrastructure. This allowed for the possibility of new kinds of trade characters. Trade characters not restricted by their two dimensional counterparts. Above you will see two computer generated trade characters created for Chex Choco Crunch. These CG trade characters can easily be reused within the Chex Choco brand. Some could argue that the use of 3-Dimensional trade characters is a sign of the dying of an artform--that a little part of the soul in these characters is lost. Others argue that a medium is just a medium--2D or 3D. I personally agree with the latter. After all, the above piece illustrates that trade characters are still being used in the traditional ways they always have been: smiling, giving a thumbs up, and pushing their product. The method of doing this irrelevant. Here, however, we see that CG characters are being used in new ways. Ways not attempted previously. Perhaps the artist intended this character to look excited. Yet, one reading could be that it is actually quite scared, perhaps putting its arms up for the police siren. It is easy to imagine it reacting to a small explosion. 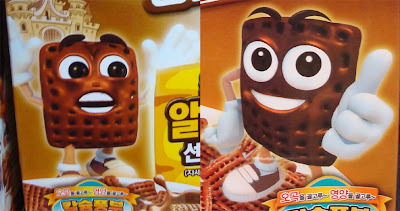 Here is a side-by-side comparison of the Choco Chex character. The character on the right is traditional and conservative--giving the ubiquitous thumbs up. The character on the left looks either very excited, very scared, or both. It is a new expression in this artform. The character on the left represents a break from tradition. Perhaps even a new direction for cereal box art. 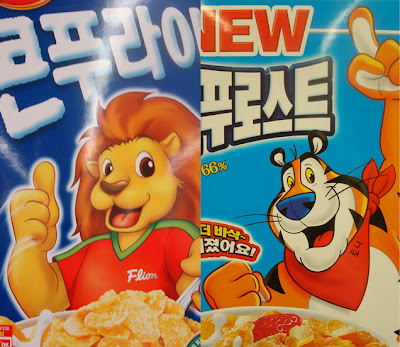 Time will only tell what the future of cereal box art in Korea will hold. Hopefully, the future holds more unique and clever pieces to take the artform to new places. Thanks for visiting the Sugary Cereal Characters gallery in Seoul. Please visit a gallery (i.e. super market) near you! 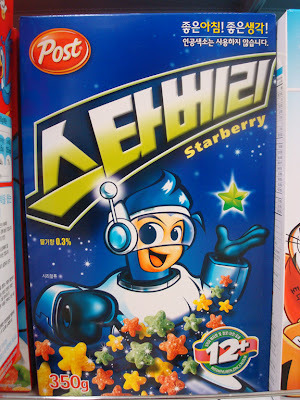 I love the Starberry robot mascot. I wonder if he is included in the Robot Museum in Seoul. Ha ha, Helly! They should include him at that museum. I think it's really cool to have a Mega Man-like cereal mascot! Does Tony the Tiger still say "They're grrrrreat!" or something similar? 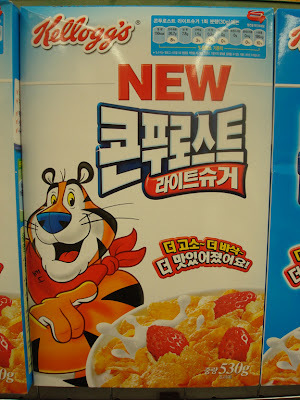 Is that cereal really called Corn Frost in Korea and not Frosted Flakes? Corn Frost is definitely not as catchy as Frosted Flakes. I always wondered how the language translation works out. Wow I'm amazed at the depth of your interpretation of cereal boxes! It sounds pretty true though, I learned a few things for sure! I love how you caught the use of the "airy" sky elements to represent "light" sugar cereal. That was a pretty brilliant design choice actually. Trojantrumpet, I'm not sure what Tony the Tiger says here. But I do think Corn Frost is a better name than Corn Flate. I don't know what a "flate" is? I think the change in names is an issue of name availability. I think all the possible combinations of corn + flake + frost have been utilized. Since breakfast cereals are a Western invention, I think the English names are meant to add to that cache. 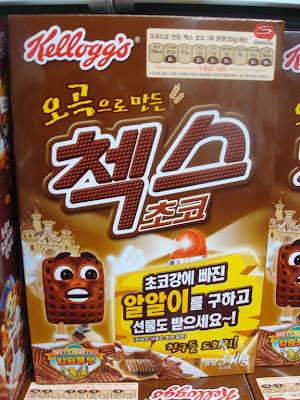 Somebody should just give a decent Korean name to a cereal like Moshis O's or something, ha ha! Iandale, thanks for appreciating my interpretations! I appreciate your appreciation! 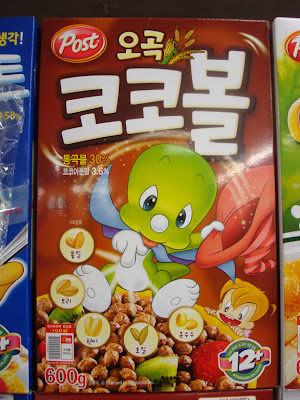 The Coco cereal with the green dinosaur and the three-toothed child actually show characters from a very well known Korean animation called "Little Dino(saur) Doori". (the child is actually a baby boy). I don't know if baby's ecstatic 3-toothed design was as intentional as you said since the character in the show is often portrayed as such. 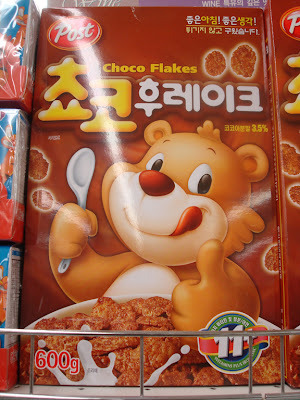 But I've quite enjoyed your insight on Korean cereal box characters, especially that of the light sugar Frosted Flakes. 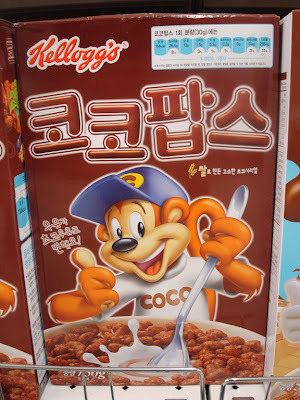 I came around trying to get information if they had any type of cereal over in Korea. But one question is the first one really called Froot Ring? 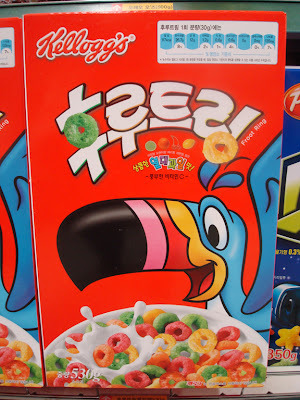 It's called Froot Loops here and the bird is Tucan Sam. Interesting spin on a western invention though. 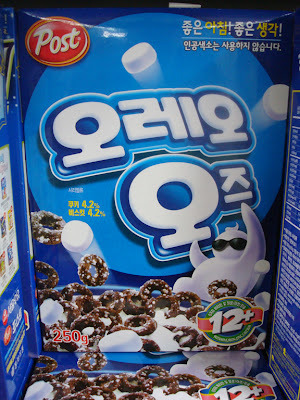 Can you write the Korean Text out for Oreo O's?